I am sitting perched on a bright green hillside, overlooking the most stunning vista of terraces and farmland. The house owner, Wira just bought me a fresh glass of steaming Jasmine tea and our kids are playing with the owner’s young daughters just behind me. 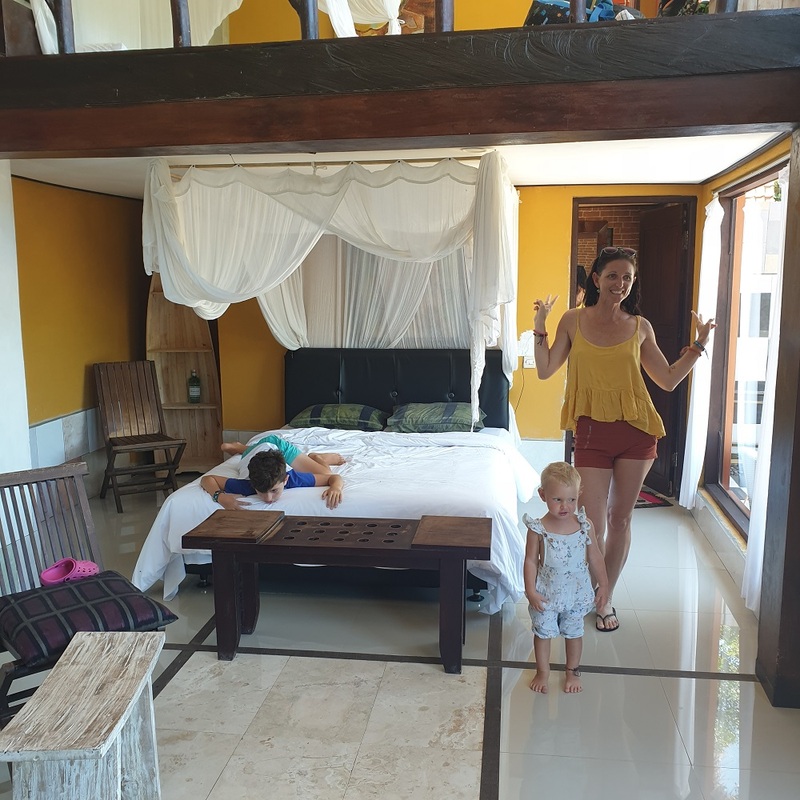 This house is the best place to stay in Sidemen Bali! 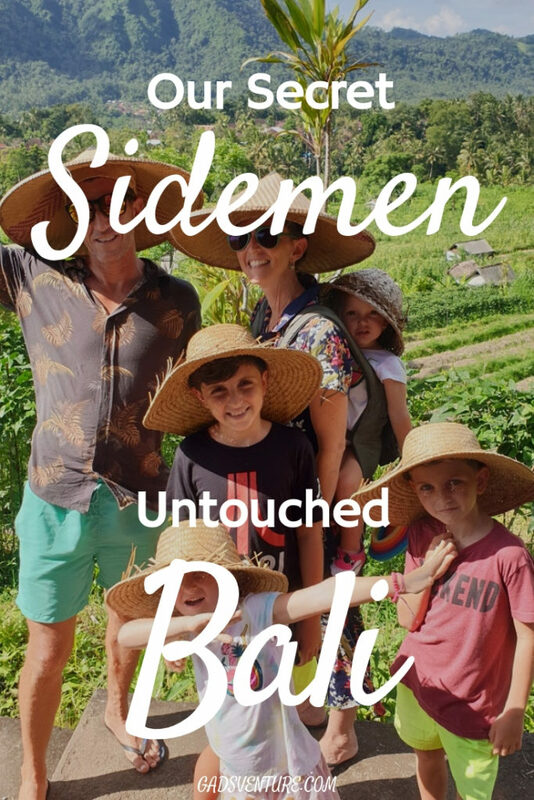 What is there to do in Sidemen Bali? Sidemen? 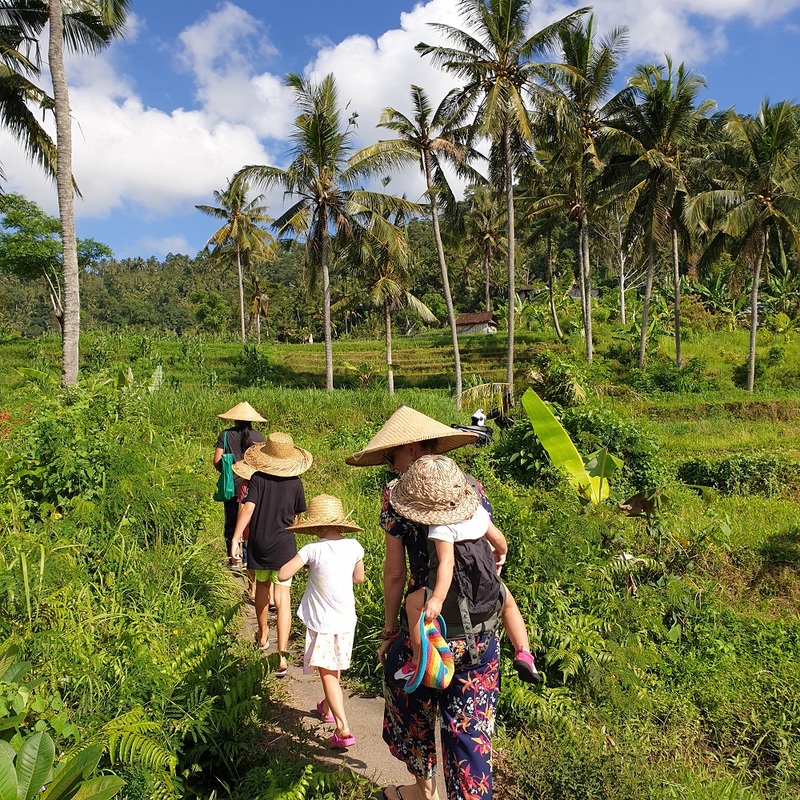 We are only a few kilometres from the ocean as the crow flies, but the windy road through the volcanic mountains takes at least an hour to navigate from the centres of Ubud or Amed. 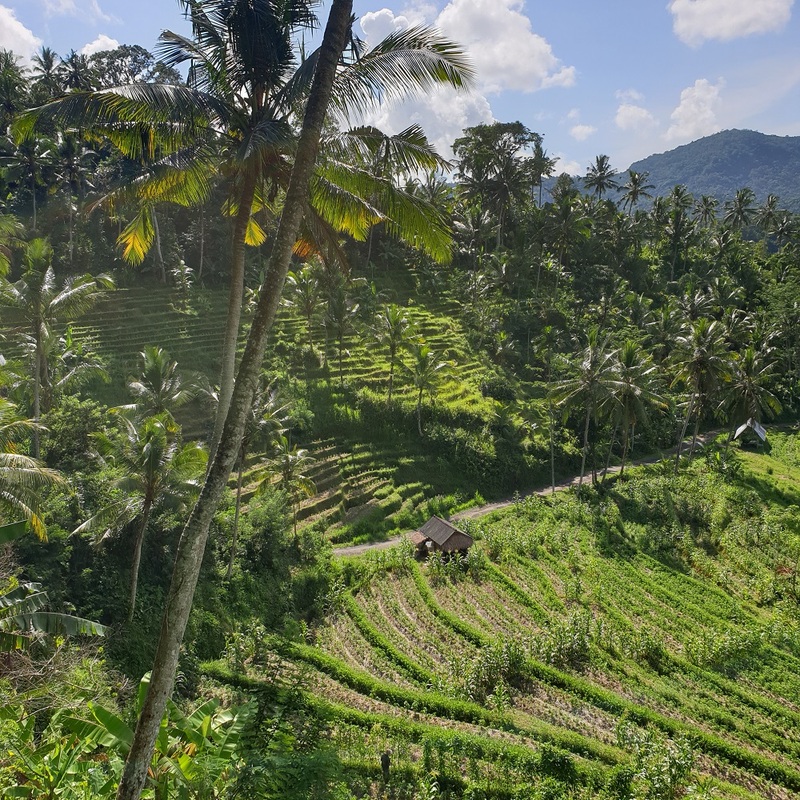 We came from Amed, up through a beautiful green valley growing crops of everything from snake fruit and dragon fruit to rice and chillies, interspersed with bananas and coconuts. It was such a peaceful and pretty drive and cost us 300,000IDR. 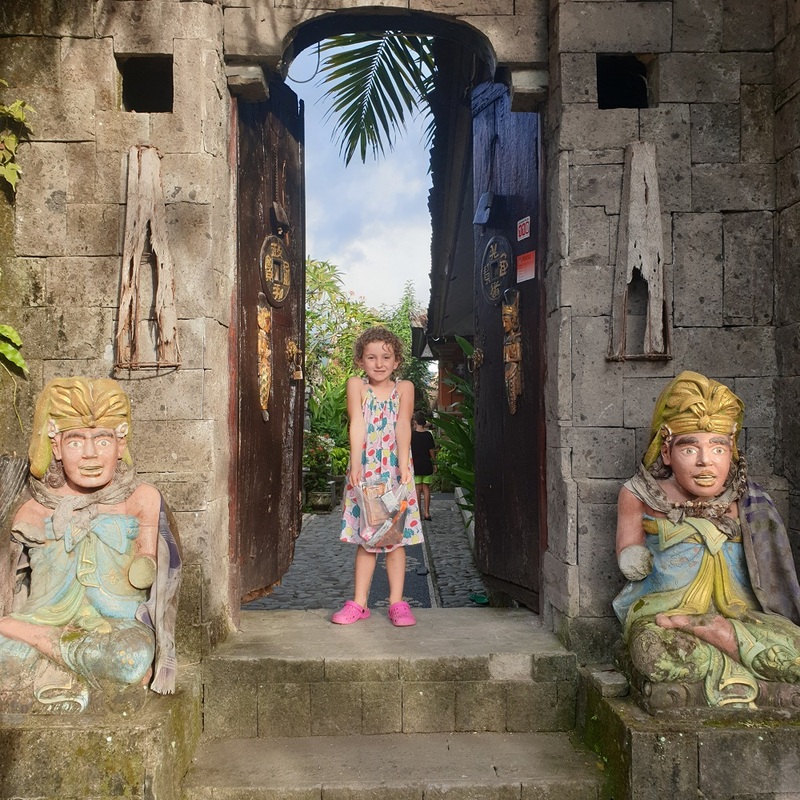 We spent an incredible 4 nights in Amed, on Bali’s lesser visited East Coast. Read this for all the details, including where to get the best coffee in Amed! We had arranged our transport through Airbnb with the villa host and I was so glad we did, as I don’t think any old taxi driver could have found the place easily! We passed through the village of Sidemen, which has a small supermarket and an ATM, and then continued on once the wide narrowed, and got very bumpy. The anticipation grew as our driver described the track at one point as ‘extreme’! 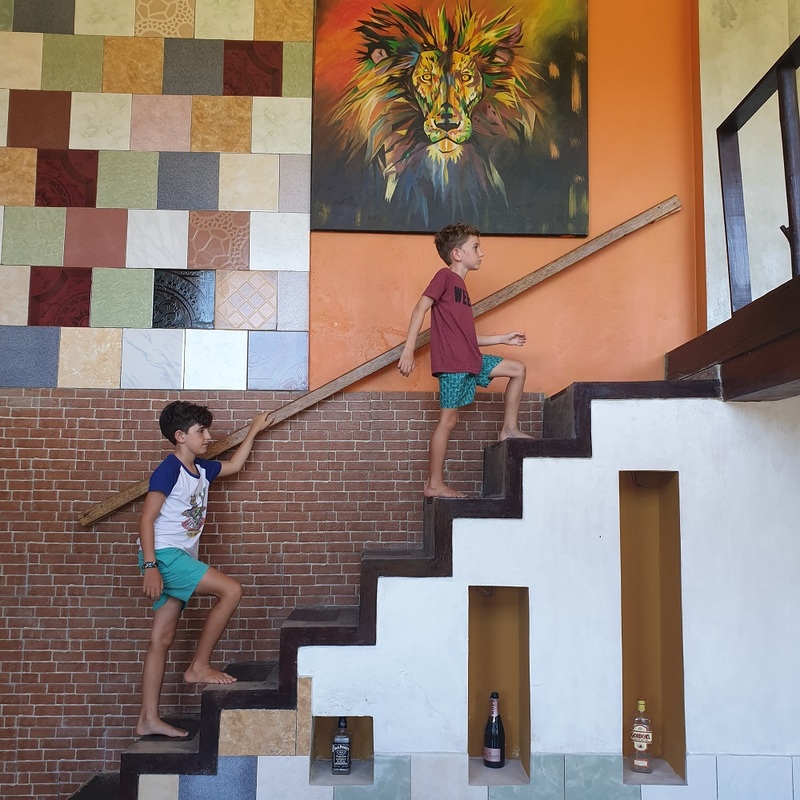 And all of a sudden, we had arrived at our beautiful Natural View House Sidemen Bali. After a couple of recent Airbnb fails, we were so happy that this one turned out so well! The entry-way was the first thing to impress with a spotlessly clean and decoratively tiled pathway leading through the family compound. The friendly and timid family dog was there to meet us, along with the whole family! Wira and his wife Lisenna, and their 2 daughters, as well as a group of various family members and staff. They quickly provided us with a delicious welcome drink and showed us into our amazing private 2 story apartment. 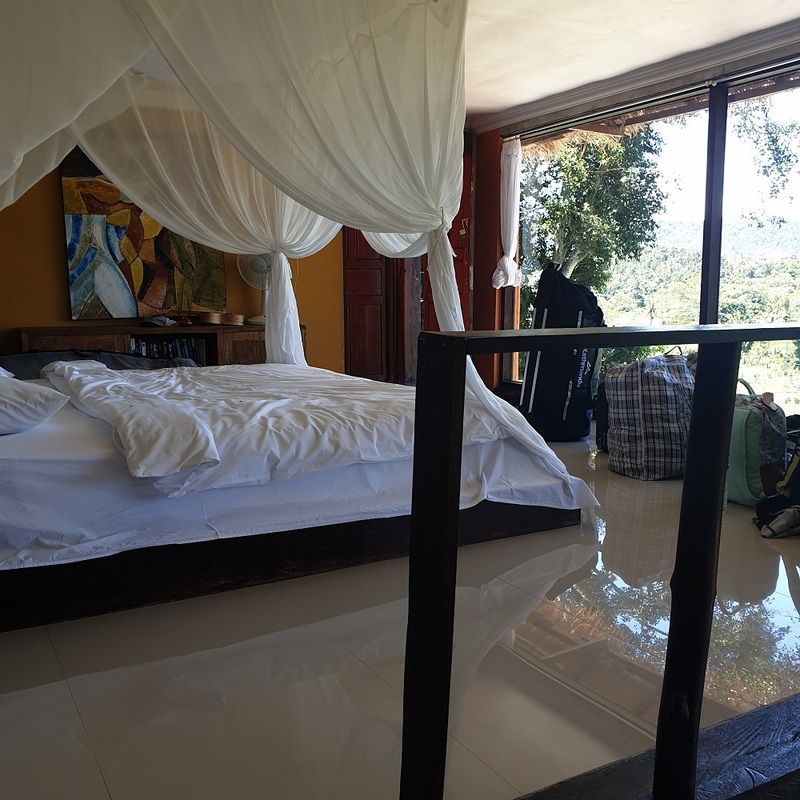 There are 4 different rooms here, of varying sizes, but they all have one thing in common, that incredible view! We are about 200m up in the air on the side of the hill, and down below is a rich verdant farmed valley. The crops are grown in picturesque rows of corn, chillies, beans and rice and there is a rocky running river just behind this. The narrow valley floor then steeply rises beyond to the rises of lush green jungle covered mountains. We can see a few red roofs, and a few farmers toiling in their fields. Wira also manages from here a few nearby private villas which sit in the middle of their own rice fields. These are very quiet and guests visit the main View House for meals. The entire front of our room is huge glass windows which face this stunning view. The door opens into the master bedroom with a four-poster bed and mosquito netting, then it’s down the stairs to the kid’s room with a netted queen bed and a sitting area. The air-conditioning and the hot showers are spot on (well, most of the time). The bathroom is a refreshing blend of eclectic tiles with a massive shower area, and you can even look out at the view from here with a floor to ceiling window! A loo with a view! The downstairs contains a water filter, TV, gas cooktop, kettle and fridge and though we couldn’t actually get the TV to work, we would rather watch the view anyway. Doors then open up to the terrace with a daybed and another eastern facing sitting area, and then onto the beautiful infinity pool from which you can gaze out over that vista for ages. The common area upstairs is the family living area, as well as shared by all the guests. There is a beautiful roofed area leading onto a large terrace with comfy couches, daybeds and chairs and tables. Bookshelves full of books and toys will entertain and educate the kids and adults alike! 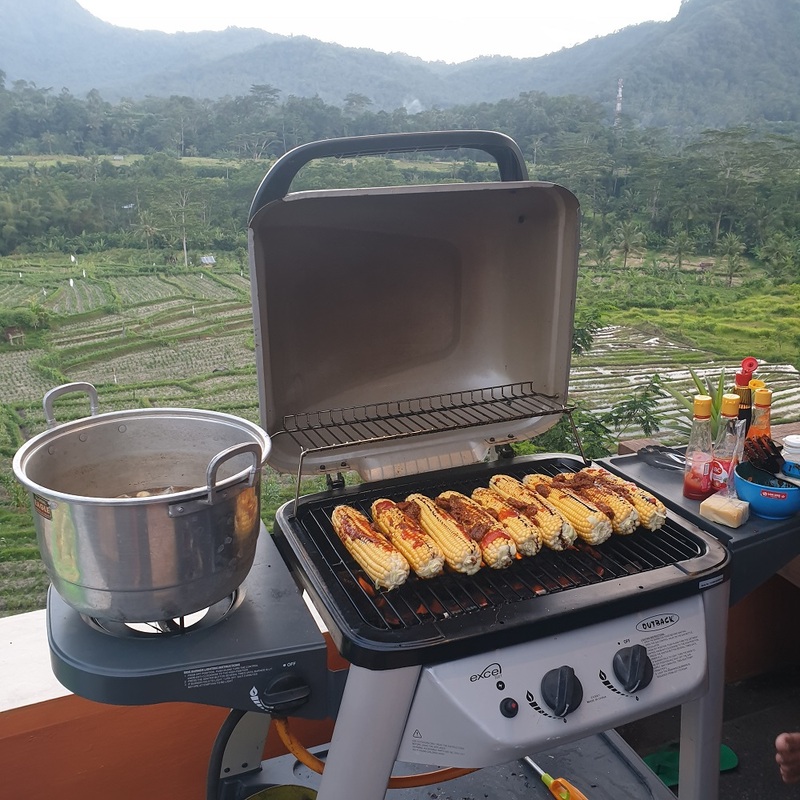 Every Saturday, Wira, the owner hosts a BBQ for his friends, family and guests. There is great food, and karaoke. He is a great guy who really believes in giving back to the community here. He even provides regular English lessons for the locals. 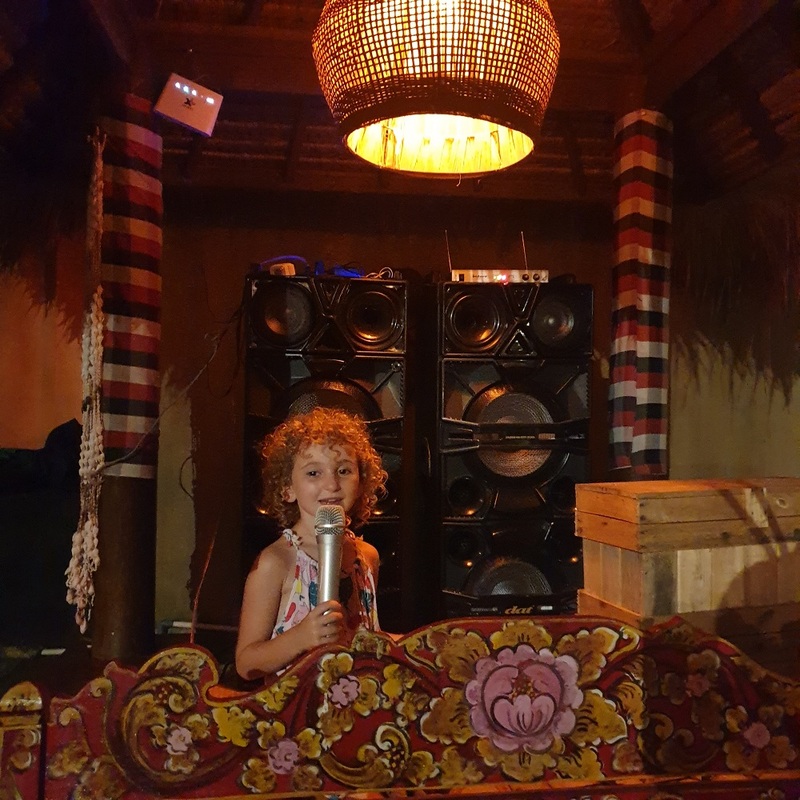 Daisy – the karaoke star! Breakfast is included with the room rate and consists of either omelettes or the best ever pancakes with fruit salad. There is free tea and coffee all day, and free rice. There is a simple menu, and they are very accommodating when it comes to providing plain food for the kids. But we love the Cap Cay! It is so chock full of veggies and flavour! You can also order a whole roast chicken, but you need to give them a few hours notice for that one so they can go and kill a chook first! They boiled up the chicken, and then served you the soup while the bird was crisped up on the grill and then served with Balinese sauces, and rice. After the all-vegetarian menu we had been having for the last few days, it was an amazing meal! 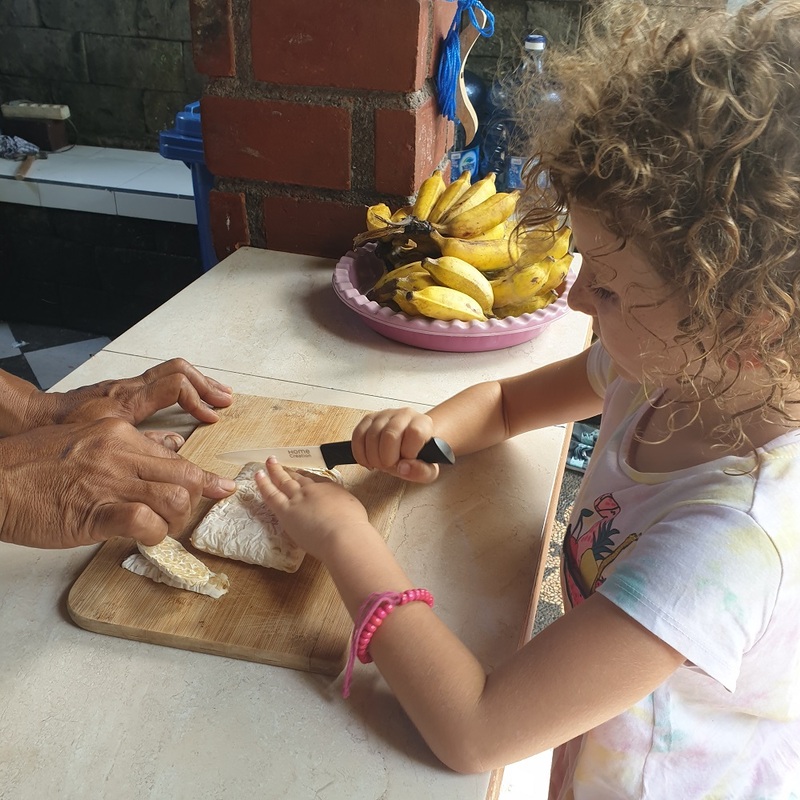 There are a few very simple general stores in walking distance of View House from which you can buy snacks, chocolates and ice creams but Wira’s View House is the only place in the immediate area serving meals. Nature View House was a good 15 minute drive from the town of Sidemen. We absolutely loved it for the rural feel, the gorgeous view, and for the price! Ours was booked on Airbnb – here is the link. But you can also check prices here on Booking.com. 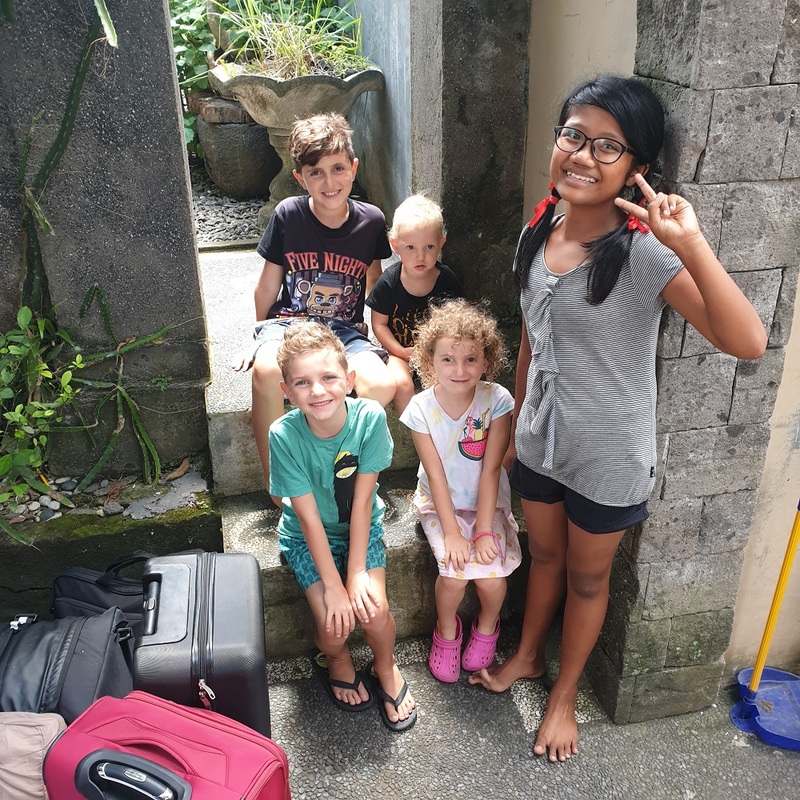 It is listed as a homestay, and I guess that is exactly what it is, as the whole family is there to cater to your every need. Their 12-year-old daughter Mirei speaks the best English in the family! Closer to town, there are a collection of villas which line the one street overlooking the river. Wapa de Ume looked particularly inviting with some distinctive thatched roofs, a 2-level infinity pool extravaganza and a very fancy driveway. A 5-star double room here will set you back around $250AUD per night, making it one of the more flashier places to stay in Sidemen. A shuttle service is provided into Sidemen if you need it, otherwise your hosts will go and get anything you need. You can hire a scooter or bicycle if desired, and get your laundry done, same day service. There is a massage guy at View House who does the most intense remedial massage I have ever had. It is only 100,000IDR per hour. That’s $10AUD. Now, I am not into relaxation massage. I believe that massage has to hurt in order for it to do any good. This was such a magical deep tissue pressure point manipulation, I felt like putty in his hands. He even gave us abdominal massage which is great for if your guts are feeling a bit off. Literally the best massage I have ever had! So blissed! A cooking class here is an absolute must do! For only 150,000IDR per person your morning is sorted! 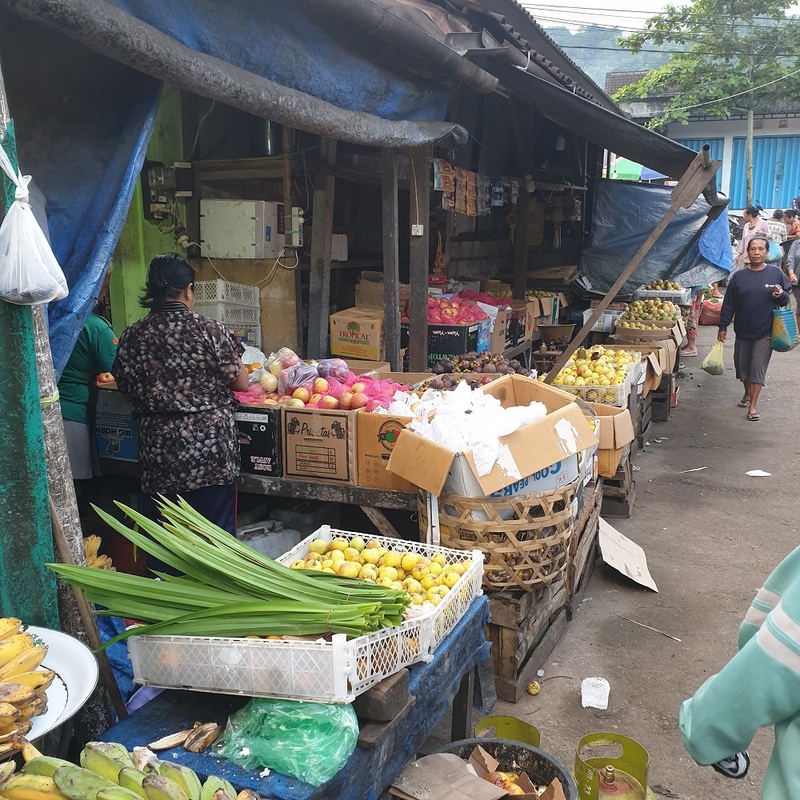 Wira will take you to the local market at 6.30am to buy the freshest farm produce. This is an experience in itself! The sights and smells here absolutely astounded the kids! We were like celebrities among a chorus of ‘Hallos’ and everybody wanted to pinch the cheeks of our cute daughters. Ok, it was all about the kids, I’m certain we wouldn’t have gotten the same joyful attention without them. But it was fun, if not a bit overwhelming. Make sure you have small notes with you, and try to have your wits about you so you don’t pay stupidly inflated ‘tourist prices’. Dragon fruit are 10,000IDR per kilo, not per dragon fruit, for example. The next part of this astonishing morning of food involved a walking tour up and over hills. 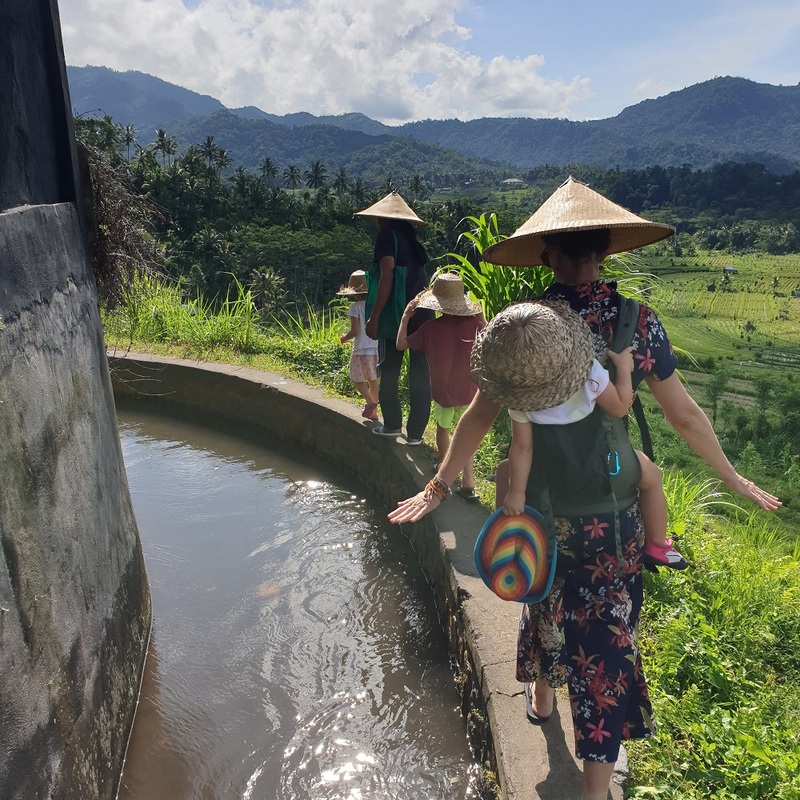 Navigating narrow pathways and skipping atop the banks which hold the water in the rice terraces! There is a concrete viaduct running through the entire place which provided a slightly dangerous way around too. The kids loved weaving through jungles, and farmland. 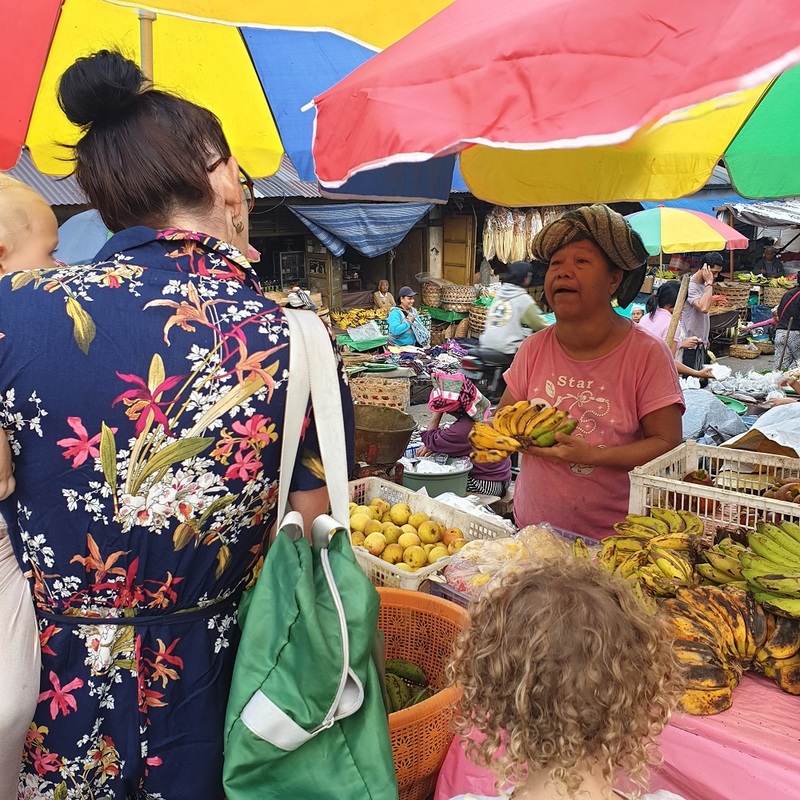 Our guide pointed out the incredible array of tropical fruits, and vegetables everywhere you looked. We saw coffee and cacao, sweet potatoes, mangosteens, papaya and so much more. Such a beautiful natural fruit bowl in this valley! Getting so sweaty by now, thank goodness for that pool at the end! We came back to the house with all our food and set about preparing an incredible feast! The kids chopped and stirred and enjoyed tasting the different foods. The final banquet was delicious with a snakebean salad, fried tofu and tempe and a peanut sauce. 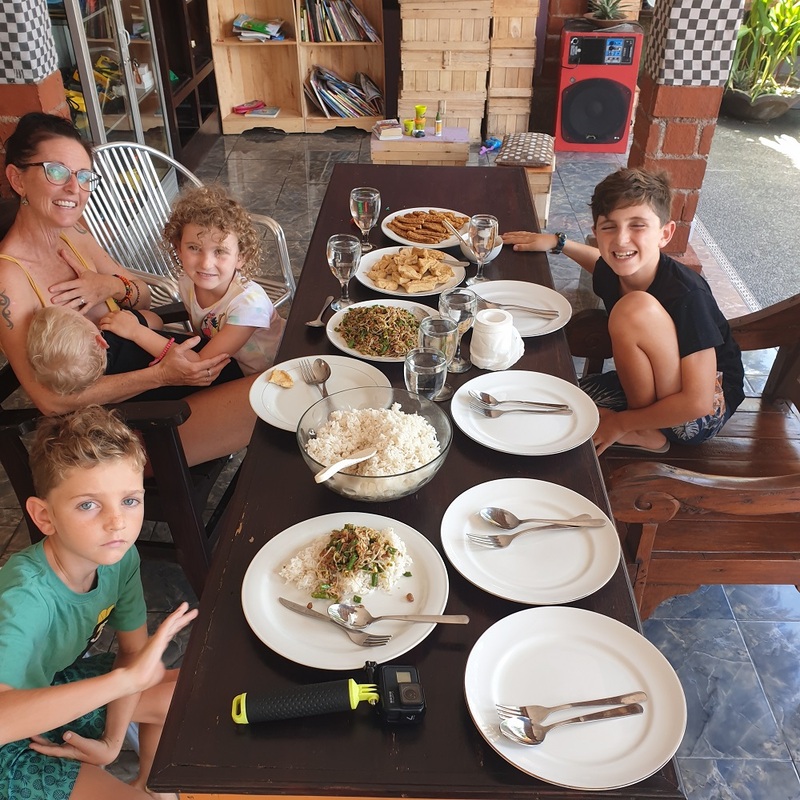 The kids filled up on rice, while Brian and I rolled out of there full of the freshest Balinese food! There is not whole lot to do here, but there was enough for us. We stayed for a few delightful nights. The villa was only priced around $30AUD per night. You can find it here on Airbnb or here on Booking.com. You really feel like you are miles from anywhere! It is the perfect place to chill out for a few days. Catch up on rest in the comfy beds, and waste time looking at the view and contemplating life. I am so happy we ended up here. Well, the wi-fi is pretty bad, or mostly non-existent actually and the power keeps going out. But that’s pretty normal for rural Bali. The beers were warm on our arrival which is a big no-no for us! The road here was terrible, but it was only for 5 minutes or so of ‘extreme’. And the hot water was hot for the first 2 nights, but cold for the 3rd. There are some enormous bugs at this time of the year! Thankfully though, there only seems to be one or 2 mosquitoes. And we did see the biggest gecko we have ever seen! There is a super steep set of stairs leading from the upper terrace, down past the rooms to the swimming pool. This definitely gave us some anxiety with our little ones. You are a long way from a hospital here, so we sincerely didn’t want any serious injuries. Inside our room, the upper level is framed with a flimsy and wobbling handrail which did not warrant trusting in the slightest. There is also another set of treacherous internal stairs. So, depending on the ages of your kids, this is something you might want to consider. Mabel is kept under a very close watch at almost 2. The older kids need constant reminders to be careful. (Haiti Haiti in Bahasa) The stairs might give you a little bit of grief if you have troublesome knees too. It’s cool to see another side of Bali again! Away from the hustle and bustle of places like Canggu and Seminyak, rural Bali is so quiet and tranquil. 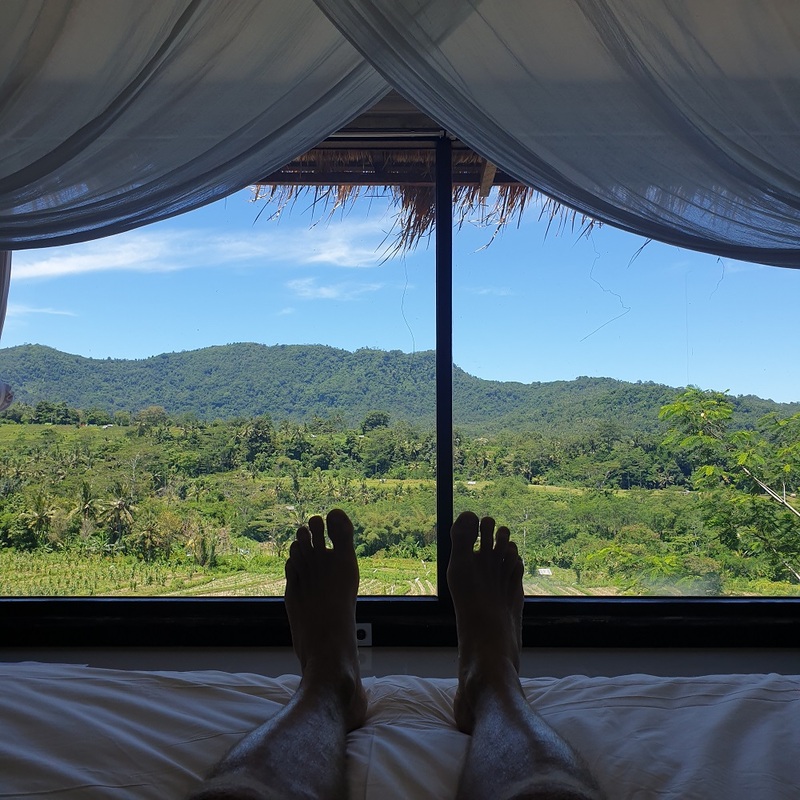 Natural View House is the best place to stay in Sidemen Bali for sure. 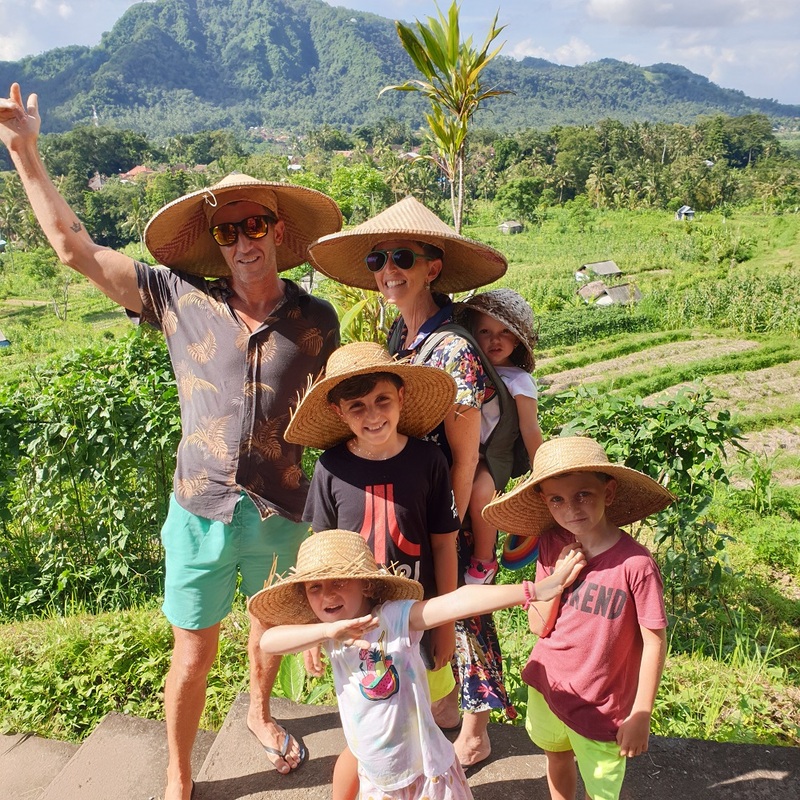 You are staying with a lovely Balinese family who will do anything they can to help you, and we just feel so relaxed and at one with the birds thanks to our stunning hillside perspective. Make it a stop on your next itinerary for soul reviving relaxation and rejuvenating massage therapy. Incredible! You’ve twisted my arm on this one! I hadn’t heard of Sidemen before, but the views sound beyond incredible. It looks like a mix between luxury and getting off the beaten track to get the best of both worlds. 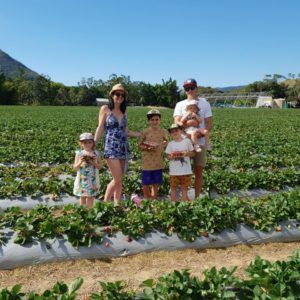 With a vast array of great food and interesting activities, it looks like one not to be missed. 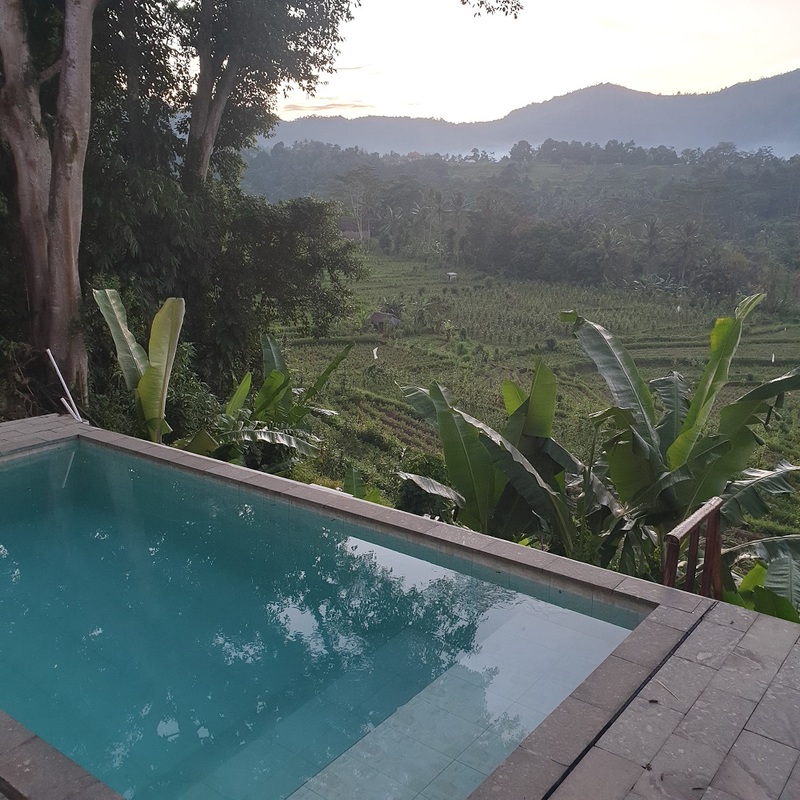 It is incredible, and if you want the mix of the absolute luxury book a villa in the rice fields so you can experience both worlds. You could get something special for about 100 dollars a night. It would be a great place to visit on your summer break, but remember it is warm in Bali and it will be warm for you at home, wouldn’t be better to travel in your winter to avoid the cold? It is truly magical and it would be an eye-opener for you. So much to do and see in such a little island. We love everything about Bali and love sharing all this with you! I am going there alone and without a companion. I’m single, no girlfriend, no wife, and no family. I will visit the place alone, with only laptop and a few belongings. My purpose for these travel adventures that I just started is, I am documenting my travel and soon start a travel blog like this one. And I think this phone camera would be enough to take pictures. I am just wondering, are all these places in Bali provided with wifi access? Yes! Most accommodation in Bali has good WiFi, but occasionally you will come across a place that has problems. It can be a little hit and miss at times depending where you stay! If you pay a little extra and stay somewhere more established it will have the best WiFi if it is important for your work etc. You can get WiFi at cafes, shops etc, most of Asia is really well connected. Hope this helps, just ask them before you commit! This would honestly be a vacation of choice for me. Here in the US, everyone is obsessed with going to the beach, but I’ve always been the mountains and forests type. The views you posted in your pictures were beyond breathtaking, and the fact you had a chance of weaving through the jungle to me would be soul-healing within itself, getting not only close but within nature. I can live without the WiFi and power for a few days, so that wouldn’t bother me. The fact that there’s not much to do is also a plus, as for me, when nature calls, that’s all I need. Sidemen is truly one of those places you go to for relaxation. You feel like you are miles away from everything but you are only 30 minutes to the beach and hustle and bustle. Relaxing is good for the soul, I hope you can visit some time in the future! No, we just leave Geckos alone, they are harmless and run as soon as you go near them! We are in Thailand at the moment and have seen some giant ones! 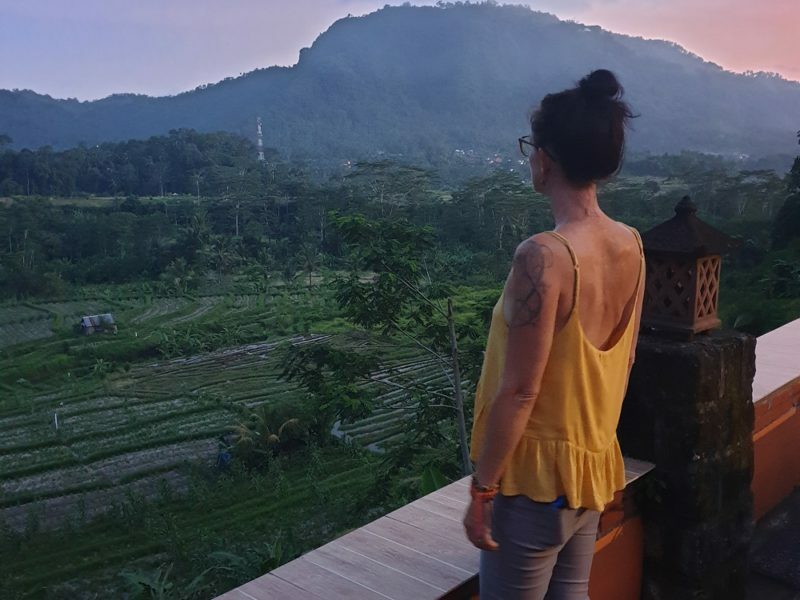 We spent a month in Bali and absolutely loved it! And your budget depends on what you would like to do, or how flash your accommodation is! 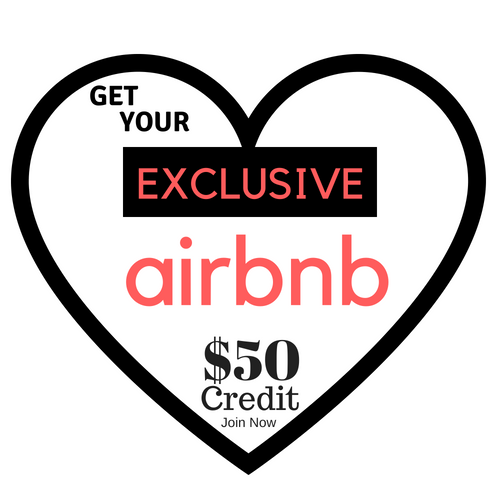 You can spend $50 – 200 a night on villas and go to fancy restaurants. A great budget for a couple who wants to travel for say 1-2 weeks would be 200 dollars a day. You would have the best time on that kind of money. We spent $100 a day on our trip but that is for a month!